It started as nausea and unexplained dizziness for Atascocita High School social studies teacher David Duez. Although he visited several doctors and went through a series of tests, Duez could not get an actual diagnosis until Thanksgiving 2010 when he woke with serious pain and could not walk. “I was experiencing extreme fatigue which I thought was because of teaching, but it never let up - I knew there was something wrong. It was the Saturday of Thanksgiving - I could not get out of bed and through a round of tests I was diagnosed with multiple sclerosis,” Duez said. 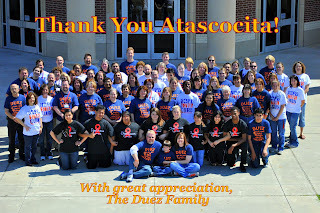 Since the diagnosis, Duez has started daily injections to slow the process of degeneration of his central nervous system and decided to share his story with his students and fellow peers at Atascocita High School to bring awareness to MS.
On the heels of one of the largest bike rides from Houston to Austin April 16-17, the MS 150, the school, teachers and students have stepped up with fundraisers for Duez and by raising awareness. 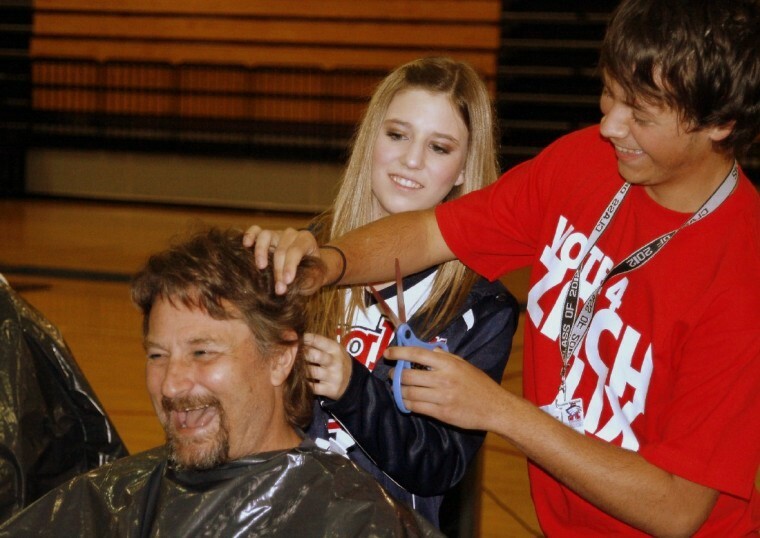 Between designing and selling T-shirts, bracelets, organizing a benefit softball game and other teachers raising money to shave their heads, Atascocita High School stands behind Duez. 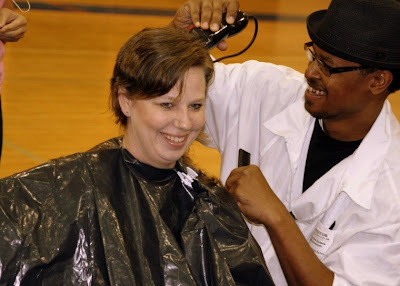 The teachers who raised money, including a few female teachers, all gathered April 14 to show their support and shave their heads for Duez. “I cannot list everything that people have done for me; it is overwhelming. 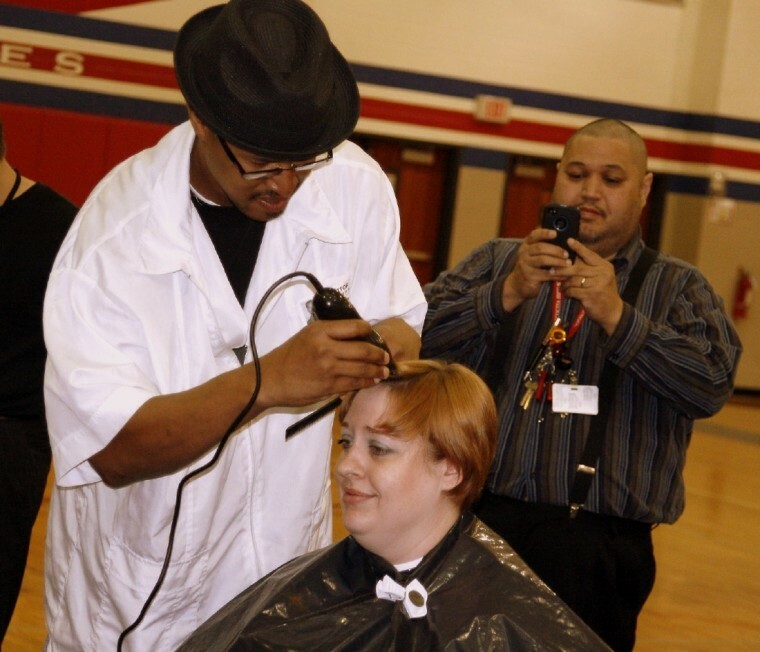 Atascocita High School comes together every year to fundraise for a different cause - I was not too surprised when they approached me about being the beneficiary,” Duez said. Fellow teacher Mark Scalia was one of the teachers who raised money to shave his head and support one of his good friends. “Everyone at Atascocita High School is like a family. We watch out for each other and help when they are in need. When Duez was diagnosed, it was something that affected us all so it was a small sacrifice I could make to raise money and shave my head,” Scalia said. Scalia added that it was great to see females join in the head shaving and since it had been a while since he had received a haircut, he forgot how cold it can be with a shaved head. 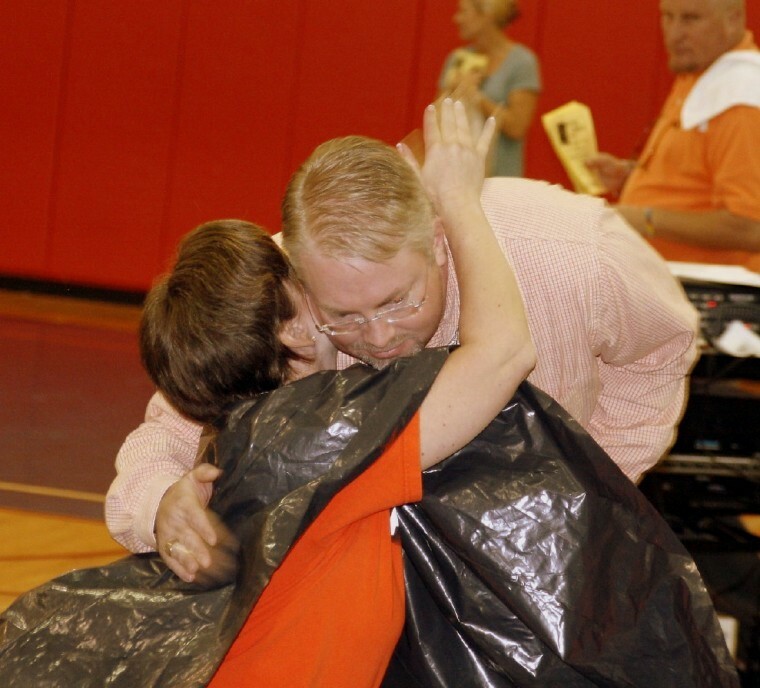 One of the teachers even raised more than $1,500 to shave her head. In addition to a foundation set up in his name, there are several local businesses, such as Charming Charlie’s in Atascocita, that have also stepped forward to help Duez and his family with medical bills and other costs through shopping fundraisers. 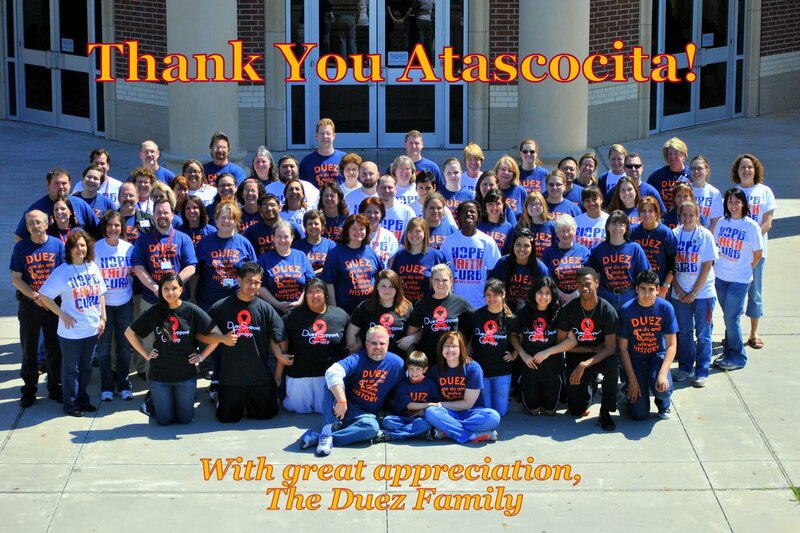 As for Duez, the doctors said it is early in the MS diagnosis and he will continue to teach at Atascocita High School for as long as he can. “With all of the support and help I have received from the school, students, teachers and community, I am making sure I pay it back in some way. Since I have slowed down due to MS, you learn to appreciate a lot more things. It means the world to me that everyone has stood behind me,” Duez said. Mrs. O'Brien got a very nice trim! 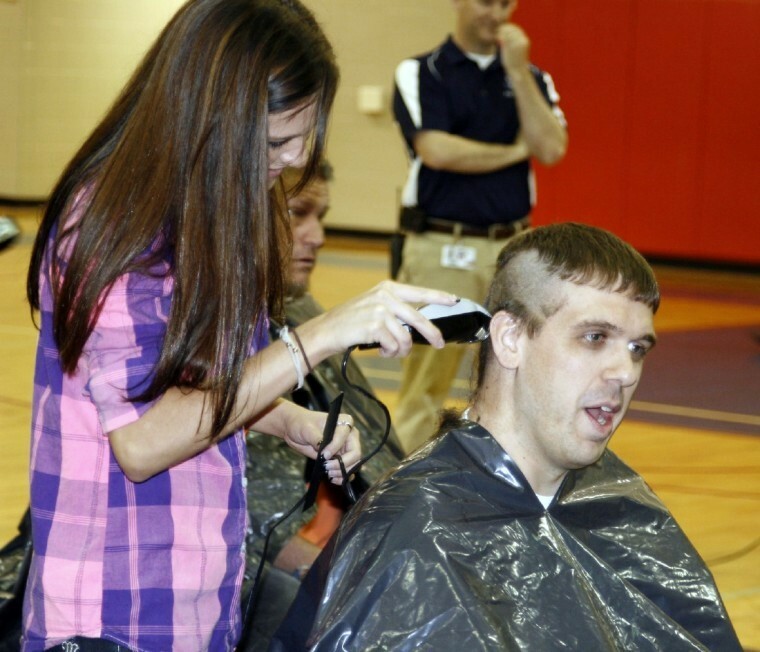 Mr. Head has his "head" shaved by Kristin, one of Mr. Duez's former students.